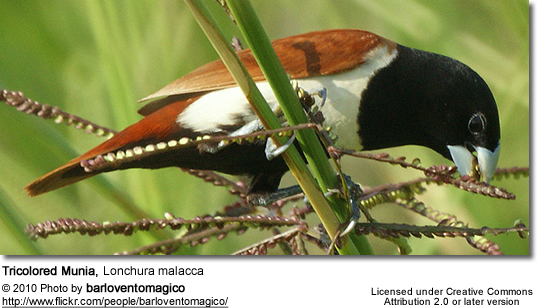 The Munias, Mannikins and Silverbills (Genus: Lonchura) are finches that occur in the Old World tropics. 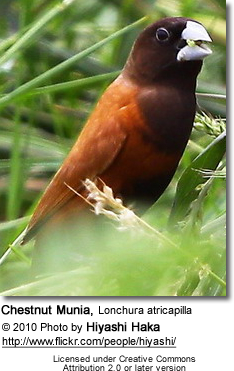 The most variety can be found in open habitats in southern Asia from India and Sri Lanka east to the Indonesia and the Philippines. 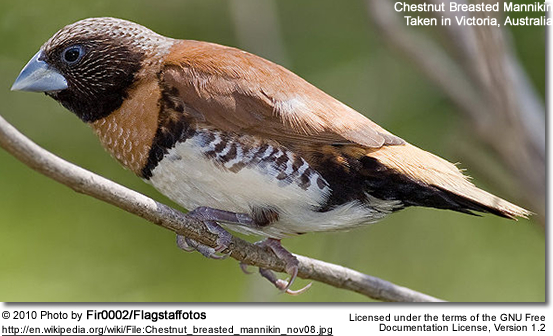 These small birds feed mainly on seeds. They usually nesta in large domed grass structure, and the average clutch consists of 4-10 white eggs. Some species also build communal roosting nests for overnight rest. All members of this genus are similar in size and structure. They have short, stubby bills, stocky bodies and long tails. Most are 4 - 4.7 inches (10-12 cm) in length. 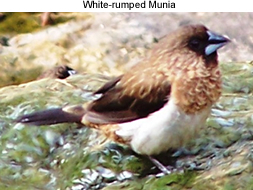 The color of their plumages are generally combinations of browns, black and white. Males and females generally look alike. Juveniles are usually duller with a less contrasted plumage. 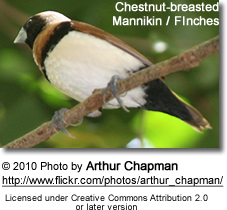 Black-throated Munia, Lonchura kelaarti - often also split.